Our idealisation, romanticism and paradoxical thinking in ecology is holding us back from finding new ways to interact with nature. Neo-nature is part thought experiment, part manifesto which suggests a new way to interact with nature in which we let go of our presumptions and emotions through rationality in ecological thinking. Geoengineering gives us ultimate control over our planet. But how will this scientific promise manifest itself? How will we move from temperature control to more complex interactions with the atmosphere? As geoengineering technologies get more precise, the scale of weather control could become increasingly local. Imagine being able to control the weather in a small town, or parts of a city. This chapter departs from, or rather builds upon ordinary geoengineering techniques and explores the aesthetics of precise weather control and its immediate influence on ground level. As we embark on a journey through a hypothetical sandbox testing facility in Mali, we see a completely artificial climate with complex wind manipulation, sunlight control, rain seeding, and weather-based biodiversity experimentation. This 254 mile wide secluded zone includes novel ways of generating electricity from planned weather, new types of agriculture, and weather-related plant conditioning and cross-pollination. a large concentration of nanoparticles whose orientation can be controlled with radio frequency. They allow the water to condense around them, but they hold it in a specific shape which can control the refraction of light. 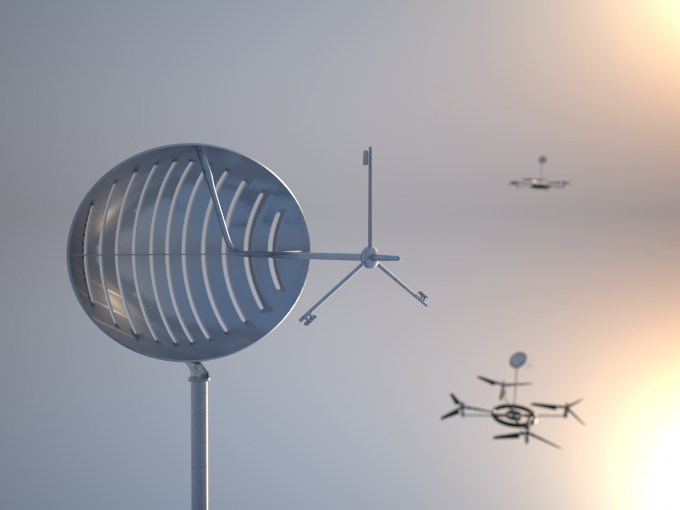 Quadrocopter drones fitted with powerful directional antennas apply energy fields in order to orient the particles in the same way. With this method, we can essentially control the direction of light, similar to shutters. We can let light into the ground, or we can reflect most of it off and darken the ground. This enables us to have complete sunshine in some parts of the land and at the same time keep others in complete darkness. 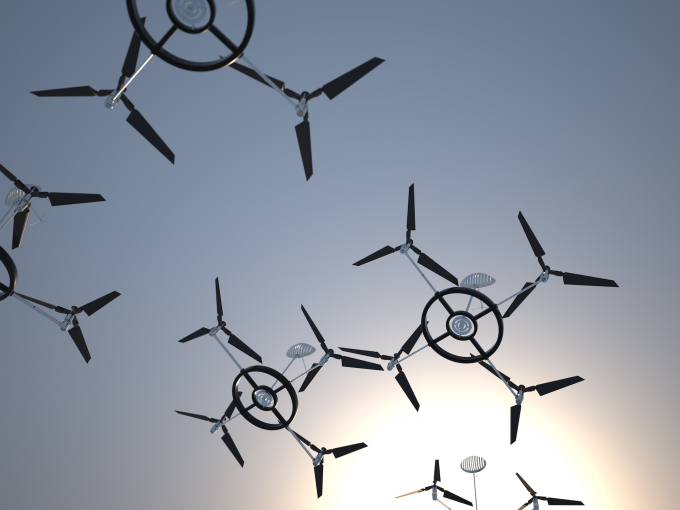 The quadrocopter drones move in groups of 8 in order to have full influence over a cubic cloud. 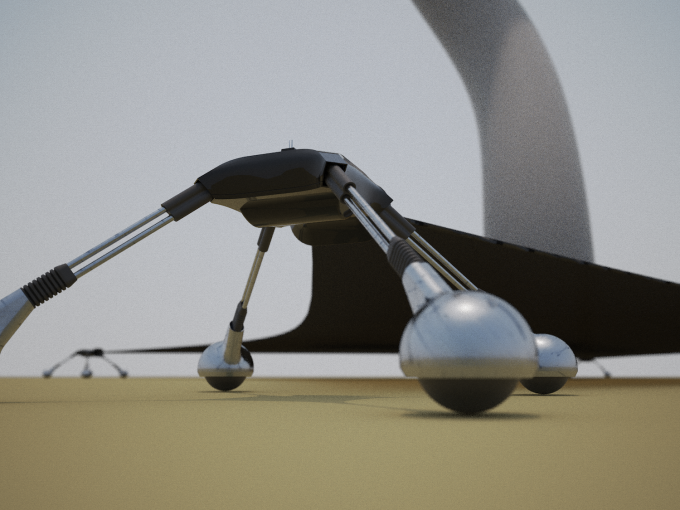 They are autonomous, returning to charging bays when their energy is depleted. Interestingly, due to the nanoparticles populating the environment, the sky will never have the comforting clear blue tone we are used to. It will be more washed out, brighter, with interesting halo effects, rainbows and optical reflections. Wind control is extremely important in this artificial climate. A current of warm moist air and a current of cold air constantly counter- rotate around the landscape. Wind is then diverted into the desired area with precisely located mini tornados. Hot and cold currents are mixed together to achieve the desired temperature. At the same time, wind is used to rotate seeds, create electricity and move moisture around the climate. Mini tornados are cast when four land drones stretch an fabric between them. The fabric heats up rapidly, creating a temperature difference between the surrounding air and the air just above the land drones. A vortex forms when the heat forces air to rush upwards. The vegetation and biodiversity in this climate is a direct reflection of the small- scale control that takes place in the sky. By utilising these novel weather phenomena, plants can be directly influenced using weather alone. A new way of carrying out agriculture takes place in which four seasons are run in parallel. Four fields are given different amounts of sunlight, percipitation, temperature and wind to simulate one of the four seasons in each field. Every season field is divided into four sections, each hosting wheat, barley, turnips, or clover. Once all seasons have been simulated throughout the year, a crop rotation takes place in which all fields are rotated clockwise. The crop rotation actually takes place by casting strategically placed mini tornados to physically rotate the seeds at the right time of the simulated year. each other. During the early hours of the day, one plant is given its optimum conditions while the other struggles to survive. In the afternoon, the climate switches and the second plant is given its optimum conditions while the first struggles. In this way both plants are able to survive with the hope to cross-pollinate and produce offsprings that can survive in both climates. By conditioning plants like this, universal plants are cultivated through artificial selection.